Takeaway: Now that you’ve conquered some of your first yoga poses at home, here are 3 more to master! Now that you have taken steps to begin your yoga journey at home, it is time to add to your repertoire! Whether you are still learning or want to build a better base for your practice, breaking down and exploring each pose will help you maximize the benefits and reduce risk of injury. In addition to the first 3 foundational poses (Tadasana, Paschimottanasana and Kumbhakasana) in New to Yoga? 3 Foundational Poses You Can Master at Home, these asanas will help develop and progress your practice at home and allow you to rock it in the studio. To ensure you are mastering these poses, it is wise to take photos/videos of yourself or use a mirror. Having a visual of yourself allows you to understand how to better position your body and helps to increase overall awareness. Try to hold each pose for 5 – 10 breaths. Adho Mukha Svanasana is used in many yoga classes during Sun Salutations and as a transition into other poses. This pose helps to build upper body strength while also stretching out the lower body. You should feel stable because the weight is distributed evenly. Your palms, fingers and upper arm muscles should be activated and engaged as you press the floor away. You should not feel pain in the wrists. There may be several reasons why the heels may not touch the floor. That’s OK! The key thing to remember is to keep the spine straight. That may mean bending the knees and/or having the heels lifted, both of which are completely okay to do. Keeping a straight spine helps to keep the bend from the hips. The feet may be more, less or equal to hip-width apart, and the arms may be more, less or equal to shoulder-width apart. This is under your discretion as to what feels best for you. An excellent and effective alternative to Urdhva Mukha Svanasana (Upward-Facing Dog Pose). Bhujangasana is a great backbend to perform as a beginner. It opens up the chest and shoulders and stretches the abdominals. It puts much less stress on the back and wrists than Upward-Facing Dog Pose while still strengthening the arms and shoulders. You should feel the hands, arms and shoulder blades activated and a stretch in the chest. You should feel a bit of tension in the lower back, but not enough to cause discomfort or pain. You may also feel a stretch in the abdomen. You should not feel pain in the wrists, lower back or shoulders. Start with your palms down on either side of your chest before pressing and lifting the chest. You can lift your chest up a few inches off the ground or until your elbows are at 90 degrees. Your hands can be placed in line with the shoulders or further apart as long as your body is stable and you are able to lift your upper body with control. Your feet can be together or hip distance apart, but can also be further apart if it decreases tension in your lower back. The thighs and tops of feet remain on the mat. To help stabilize your upper body, place a rolled up blanket or bolster underneath your chest. This will help give more support to lift your chest while you continue to build strength in your arms and shoulders. Half Cobra Pose is a great variation to start with. In this variation, the hands are placed on the mat on either side of the chest as you slightly lift the chest. You do not need to press through the hands in this asana because they act as support to keep you stable while you lift. If you would like to increase the sensation in the lower back without lifting your chest higher (to maintain a c-shaped back, of course), slowly bend your knees and lift your feet up. Lower them down if you feel discomfort or pain. You should feel your entire body engaged. 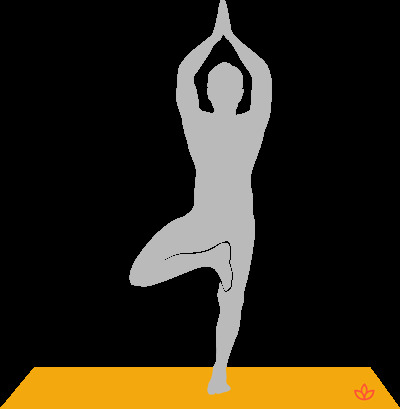 The feet and ankles are the stabilizers for this pose and if they are weak, you may feel wobbly. As you distribute the weight evenly through the foot, you will find more stability. If you are placing your lifted foot on the standing leg’s inner thigh, you may feel the foot slipping. If the foot slips, try pressing the foot and the inner thigh into each other. If it continues to slip, place the foot against the inner calf instead of the knee. You should feel a stretch in the groin and inner thigh once the foot is stable and the knee opens up the hip. Keep one hand on your hip while your other hand slowly places the lifted leg’s foot. Once the foot is in place, keep both hands on the hips until you find alignment and balance. Bend the standing leg's knee slightly to ensure engagement in the quads. To start, the non-balancing foot can rest with ball of the foot on the floor and heel leaning onto the inner calf. Once balance is achieved, the foot can rest on the inner calf or the inner thigh. In order to master these asanas, you must perform them with purpose and mindfulness. By moving into these poses slowly and with control, you will become more aware of sensations in the body and feel more connection with the breath. Adhering to your body’s own capabilities will allow you to create a stronger foundation for more advanced asanas and will minimize any risk of injury at home or in the yoga studio.